Spitz dog with very thick, fluffy and rather stiff hair. This wool gets dirty easily, falls down, forming mats, cling to it seeds. A neat haircut will help to avoid these problems, facilitate combing and give him a neat, attractive appearance. Breed standards do not include a haircut Spitz, so if a show dog, her haircut is produced several months before the planned event that the hair has time to grow. For show dogs permitted only small trimming of the protruding ends of wool on the edges of the ears, around the paws and hind legs – from hip to hock. If the participation of Spitz in exhibitions not planned, you can do more short, having curly hair. Remember that removing too much fur can lead to violation of thermoregulation of the dog and the appearance of bald spots on the skin. Haircut Spitz begins with a thorough combing of his fur. Pre-all wool slightly moistened with cool water, combing with your fingers, so that water infiltrated in the upper layer of hair and undercoat, rubbed down the dog with a towel. Starting from the head, Spitz comb comb with a few teeth, separated by parting the hair into individual sections. After that, the dog carefully comb massage brush and comb with frequent teeth. Clippers will need hairdressing scissors with rounded ends and one-sided thinning scissors. At the beginning of the haircut Spitz clean the excess hair from the back of the ears, after which, equal to this length, cut the ends and the front surfaces of the ears. On the anterior surface should not remove too much hair, or ears will visually look bigger than it actually is. Afterwards, a contour "collar" - remove extra hair behind the head, the sides and c the dog's chest. The length of the removed first straight scissors, trying to give the "collar" rounded shape, and then edge trimmed using thinning shears. The length of the fur "collar" is used as a reference when cutting the body of the dog. Remove protruding hairs on the shoulder blades, back and side surfaces of the thigh, moving in the direction from head to tail. Thinning shears smooth the hair all over the body. Tail shear thinning shears alternately from two sides, leaving enough long hair – this creates the illusion of high-rise tail and facilitates the dog he flips him on his back, according to the breed standards. For hygienic purposes is permitted a quite short cut hair at the root of the tail. 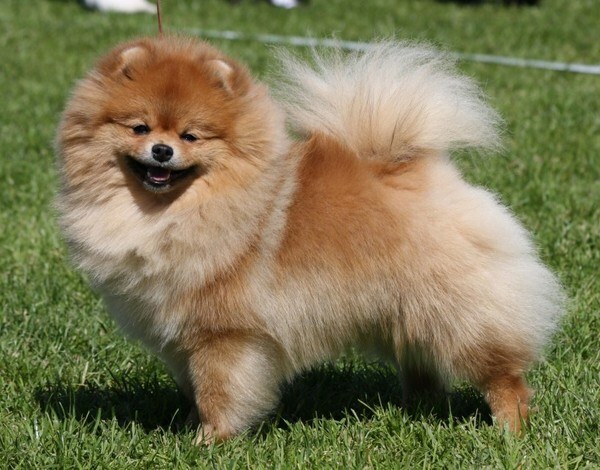 Using the slicker to pull the hair up in the front and rear paws of a Pomeranian, and then remove the excess length on leg dog. Then with small scissors cut the shank back and front legs, giving them a rounded shape. Between your fingers the wool can be cut off pretty short, as these places are most susceptible to contamination. General complete haircut trimming the length of the hair around the dog's body with the help of thinning shears.